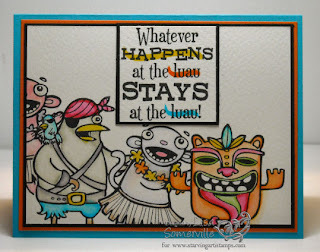 Designs by Lisa Somerville: Starving Artistamps DoodleFactory Conga Line! Starving Artistamps DoodleFactory Conga Line! Just a little Friday Fun! 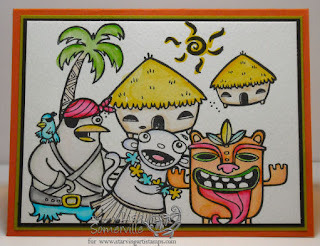 One of my blog readers asked me if I could create a Conga Line with the DoodleFactory Tropics from Starving Artistamps...This first one shows my Conga Line, on the second one, I added the hut, the inside of the card has the sentiment - Whatever Happens at the luau Stays at the luau! Both cards are done with the Marker Watercoloring from the TJNL. Don't forget you can save 10% on ALL purchases from Starving Artistamps - just use code Lisadis when you check out - there's no expiration date. ETA - I was asked...Wondering if you were masking to do the overlaps? YES, I created masks for all my images using Eclipse Tape as mentioned above. I stamped the first image, added the mask, then continued to mask and stamp. OMG, these are to die for! I wanna do the Cono Line with them! Very cute cards. Wondering if you were masking to do the overlaps?